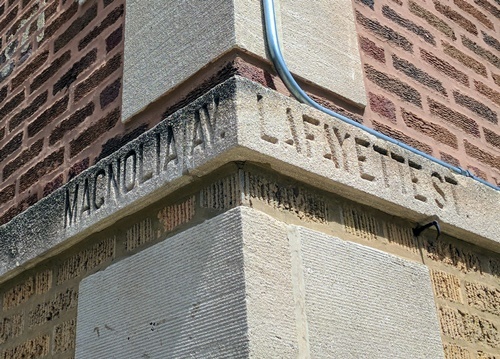 Did you ever notice the street names carved into the building at the northeast corner of Gunnison and Magnolia? We never did. And then the folks from Forgotten Chicago who spoke at the Bezazian Branch Library a few weeks ago brought it up, among other "hidden in plain sight" tidbits. We did a little research, and found out that the stretch of Gunnison that runs from the lake to 1250 West used to be called Lafayette Street. In the 1930s, many Chicago streets were renamed (310 of them, to be exact), mostly to eliminate duplicate names. Of course, everyone wanted the other streets to be renamed while their street kept its original name. Touched, the committeemen agreed with him and voted to change the north side's Lafayette to Gunnison street." 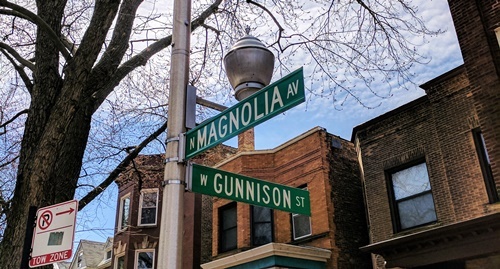 According to Patrick Butler's Hidden History of Uptown and Edgewater, the name Gunnison commemorates developer Frederick Gunnison, who once owned the subdivision the street runs through.